December 27 is the day that goes back to the 5th century in the church calendar for celebrating the life of St. John the Evangelist and is known as the Feast of St. John. We’ve already mentioned that December 26 is the Feast of St. Stephen, and December 28 is the Feast of The Holy Innocents, referring to those babies killed by King Herod the Great in Bethlehem. Which St. John is this? Not John the Baptist, the cousin of Jesus, rather the young disciple of Christ, known as “the disciple whom Jesus loved.” Tradition holds that he is the author of the Gospel of John, the Epistles of John (I, II, and III John) as well as the author of the Book of Revelation, also known as The Apocalypse. He’s also known as John the Apostle, John the Divine, John the Theologian and John of Patmos. Why? John is unique among the 12 Disciples in that according to tradition he is the only one who did not die a martyr, like the rest. Instead, in addition to participating in Jesus’ ministry and that of the early church, he lived to an old age. He did suffer one of the early empire-wide persecutions of the early church and was exiled to the Island of Patmos. Revelation says its author was on Patmos “for the word of God and for the testimony of Jesus” where he received a vision of heaven and the world to come — from the risen and exalted Jesus. While some believe he was persecuted under the Emperor Nero, this is unlikely as Nero’s persecution of Christians — while well known and dramatic — was limited primarily to the environs of Rome. 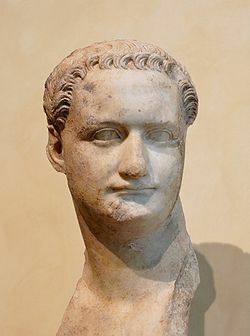 It is more likely that the later Emperor Domitian, of the subsequent Flavian dynasty, ordered John exiled during the first Empire-wide persecution. 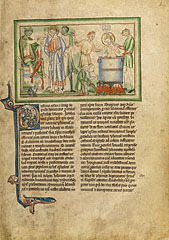 A tradition reports that Domitian initially ordered John placed into a cauldron of boiling oil, from which he miraculously emerged unharmed, before exiling him to Patmos where John wrote Revelation. While only the Gospels of Matthew and Luke contain the well known Nativity story, The Gospel of John tells the story of Jesus before he was born. Yet at the end of his writings, we have The Book of Revelation, a very different kind of literature, a type of prophetic writing known as “apocalyptic” literature. This was a popular type of literature in Judaism that spanned three centuries before the writing of Revelation. Revelation has been a real interest to us. Being outside the box for quite some time now (we home churched 7 years and an independent local church now), we encountered post-millenialism sometime back. Man, it is fascinating! Revelation makes sense at last as it foreshadows the complete destruction of Jerusalem in 70 A.D. and the whole Jewish system “soon”, “quickly”, ” shortly at hand”- the whole New Testament same thing – warning and preparing the church at that time to be ready and what to do when it comes. This eschatotogy is growing. Even John McArthur describes himself now as a “leaky dispensationalists”. And R.C. Sproul is now post-mil. Can you recommend any Robin Williams movie? He’s a genius at humor. I remember somebody telling about him acting as a Russian immigrant walking through a supermarket and he goes bananas over the variety of goods. I want to show it to my family. Also, is your course on the history of the Reformation on CD? That would be fun for us.